These positions are considered work FROM home rather than work AT home roles. That is, you’ll work from a home base, where you will do your paperwork and reporting, but you will need to travel locally to perform the necessary duties. Many people appreciate the balance and flexibility of being able to get “out of the house” for a little while and be around other adults, without having to go “all in” with a traditional job. Per employee reviews on Glassdoor, pay ranges from $8 to $13/hr., with an average of $10. The Retail Merchandiser is a part-time position that performs service work in the Hallmark department in various retail stores such as grocery stores, drug stores, department stores and mass retailers. Handles stocking, straightening, replenishing and tracking the inventory of Hallmark products, both inside and outside of the Hallmark department. These positions do not service Hallmark Card Shops. 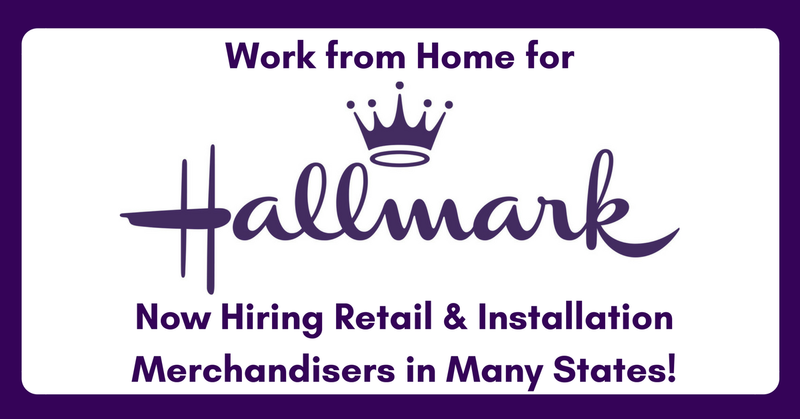 The Installation Merchandiser is a part-time position that performs installation and occasional service work in the Hallmark department of various retail stores. Installation activities include building Hallmark fixtures, moving card departments, installing new stores, store relocations, and card department remodels. Click here to see videos about these positions and then click HERE and enter the word MERCHANDISER in the “What” field and your zip code in the “Where” field to see what’s available in your area! For more jobs like these, see our Newest Jobs & Gigs page. To be the first to hear about jobs like these, like our Facebook page. Good luck in next steps! This entry was posted in Earn Extra Cash and tagged Hallmark, Merchandisers. Bookmark the permalink.